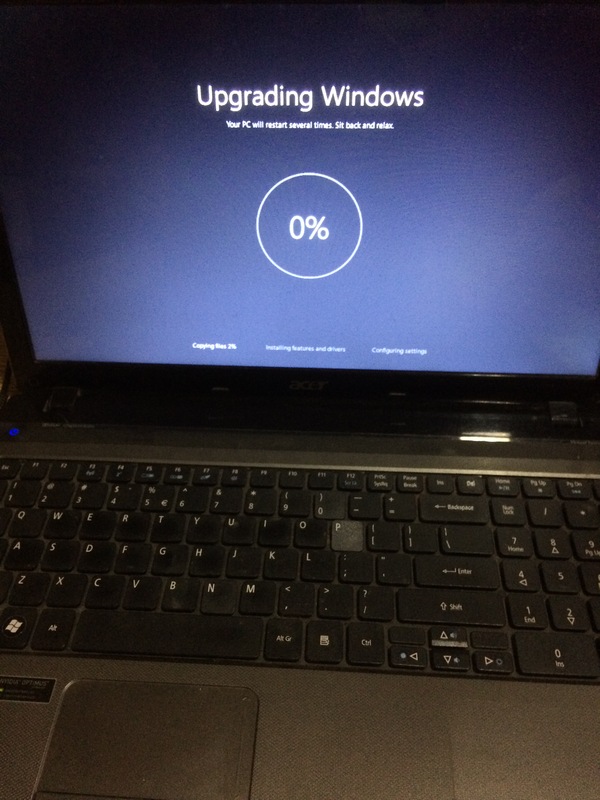 I finally bit the bullet and upgraded my 4 year old Acer Aspire 5750G laptop to Windows 10 from Windows 7 thanks to the free upgrade offer. I managed to wait for a couple of weeks after the release before pulling the plug. The machine is quite reasonably specced with a Core i5-2410M processor, 4 GB RAM, 1 TB HDD (upgraded from 500 GB) and the NVIDIA 540M GPU, and barring the slow hard disk is well equipped to run Windows 10. The upgrade process was itself quite painless – took a good amount of time to download on my 2 Mbps connection, but the installation itself took around 1.5 hours. There were a few updates including one for the touchpad, and they installed without much fuss either. I also updated the NVIDIA graphics drivers to the Windows 10 version. The OS itself is quite easy to use and I find the interface an improvement over Windows 7 and agree with my most read reviewers. Compared to Windows 8\8.1 that I’ve used intermittently over the last few years, the experience is definitely a marked improvement particularly on laptops. The overall experience is pretty much as it was in Windows 7 for me as there are not that many useful Windows Store apps yet, and the laptop is without a touchscreen to make use of full screen apps. The improvements to Explorer, Task Manager and rest of the OS are of course welcome, but would definitely have not been a compelling reason to upgrade were it not free. Cortana has unfortunately not yet released for India, and some of the newer security features require newer hardware. Having used a MacBook Air for over a year and a half now, I do find some of the new features like multiple desktops quite useful but the experience is hampered by the poor touchpad. Then of course there is the HDD vs SSD performance chasm that puts a big dampener on the Windows usage. If you are eligible for an update, don’t hesitate to pull the trigger (unless you have some incompatible components of course). I’ve also signed up for the Insider builds for some more excitement and quicker access to new features. … is a reliable means of transport to get them from point A to point B. Of course, it helps if the commute is pocket friendly, comfortable and fast. While taxis & autos in Mumbai adhere to the fare meters (unlike certain other metros), refusal is a universal problem shared by all commuters irrespective of the availability. The first generation of private cab services like Meru, TabCab, EasyCab did try to sort out this problem to an extent, but never managed to have enough cabs available or offer fares competitive with kaali-peelis or autos (AC notwithstanding). Ola also jumped into this space following in Meru’s footsteps before significantly restructuring their pricing model upon Uber’s entry. These 2 taxi service aggregators reached near kaali peeli fare levels and offered a much more reliable (read disincentivised refusals) and more readily available service. In fact, Ola even tried to get kaali peelis on their app, but the effort seems to have fizzled out after a promising start. The rest of the script is also playing out just like in the rest of the world and even a city like Mumbai, the so called commercial capital of India, has witnessed 2 taxi strikes within a couple of months. While the first strike was accompanied by Mumbai commuters discovering the basic Economics concept of supply and demand thanks to the Uber surge pricing, the second one has shown how disabling surge pricing makes life difficult and reduces the availability of cabs. Either way, the commuter has gotten the wrong end of the stick. I just hope that we find a better solution than the other countries to this whole standoff between the incumbents and upstarts. Too bad the kaali peelis and autos don’t think of adopting a no refusal policy – something that’d get Ola and Uber in real trouble.